Assistance League of Bend provides personal care items to seniors in local assisted living and memory care facilities. Shampoo, conditioner, body wash, deodorant, lotion, and oral hygiene products are delivered every other month. All of these recipients are on Medicaid, and these items are often a luxury. Assistance League of Bend is currently serving nine facilities in Bend and four facilities in Redmond. 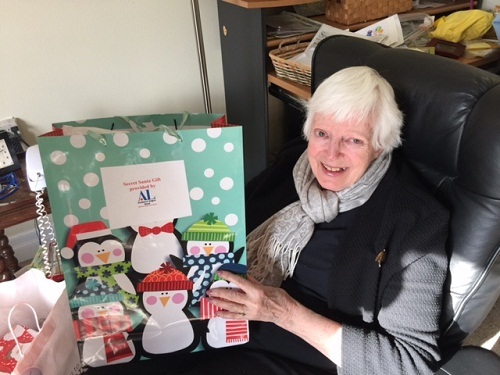 Additionally, Assistance League of Bend provides winter holiday gifts for identified seniors in need. Each facility provides a list of residents who do not have family, along with a “wish list.” Volunteers shop for personalized items and deliver them gift wrapped in mid-December. Through private grants and generous donations, we are able to provide these “wish list” items such as clothing, bedding, electric shavers, and diabetic shoes.